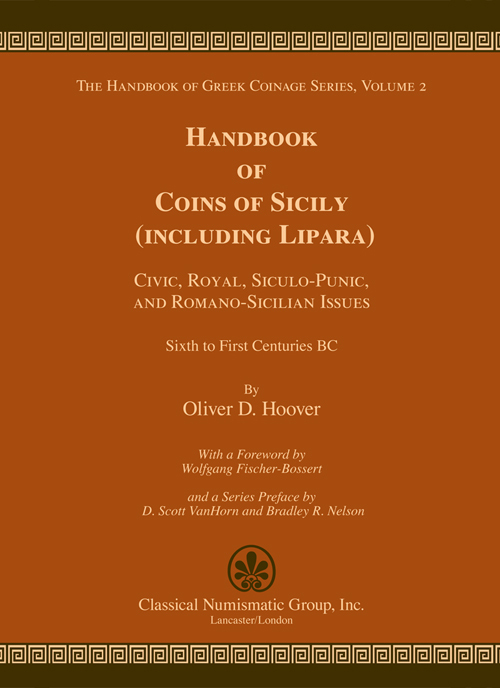 The latest published volume in the series is Handbook of Coins of Sicily (including Lipara), Civic, Royal, Siculo-Punic, and Romano-Sicilian Issues, Sixth to First Centuries BC (Volume 2 in the series). Beginning with Abakion, the catalog covers all the mints of Sicily, as well as the royal issues of Syracuse, and the Siculo-Punic coinage. The mints within each region are arranged alphabetically. The coinage within each city is arranged chronologically, beginning with the Archaic issues and continuing through the later civic issues. Issues in this catalog arranged in the catalog with silver first, followed by bronze; each metal is arranged by denomination, largest to smallest. Both civic and royal coinages of these areas are covered.